It had already been a year to remember for me after becoming the youngest-ever Scottish Girls’ champion - but now I really am pinching myself. That’s because I’m just back from the Solheim Cup in Des Moines, having been out in Des Moines as part of the #Project19 group. A WhatsApp group, it was started it about a year ago, a year and a half ago. It was all about team goals and playing goals for the future between six of us as we try and make the Junior Solheim Cup team at Gleneagles in 2019. It kind of developed from there then VisitScotland and Scottish Golf heard about this, and in April this year we had a competition, the Stephen Gallacher Foundation Under 18s. They told us then we were going to be going to Des Moines. We were all shocked and really happy, of course. The initial idea was that we would all watch the Solheim Cup on TV together, but instead we were actually there and, from start to finish, it was absolutely amazing. We got to meet all the players, watched all the matches, soaked up the opening and closing ceremonies and even got to spend some time in the European team room on the final night. It really was an incredible experience and I have been so inspired by the whole thing, especially getting the chance to watch some of the world’s leading players close up in the biggest team event in women’s golf. I’d been to the US with family before. I went to the Ryder Cup in 2014 with my family, but it was just outside the ropes watching. This was so different as, on this occasion, we were allowed to talk to everyone and everybody knew us. 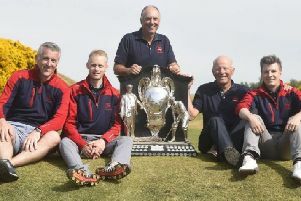 It was so cool and I would like to thank VisitScotland for providing the bulk of funding for the trip, as well as Crail Golfing Society, who gave up their course to allow the group to raise £4500 to support the subsistence costs and a start towards the tournament costs going forward. It would be something else to be at Gleneagles in two years’ time playing in the Junior Solheim Cup. The thing is I know if I work hard enough I can achieve it. I’ve seen the standard of the girls out in Des Moines and they’re all class players but it’s not far away. I just need to tweak some more things, become a bit steadier as a player, I can definitely do it.